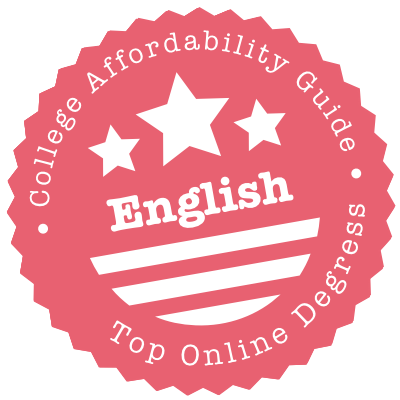 Scroll down to see the top not-for-profit colleges offering English degrees online. Bowling Green's MA in English with a specialization in English Teaching is for prospective junior high and high school educators. The curriculum features a five-course core running the gamut from literary criticism to linguistics, with an emphasis on how to teach. Students have more flexibility when it comes to electives - they must choose five and can venture outside the English department for four of them. The program ends with a one-credit portfolio project. The MA in English with a specialization in Professional Writing and Rhetoric, also completely online, utilizes the same structure. The curriculum focuses on technical writing. In both programs, most of the courses are 16 weeks long. The Online and Professional Studies Department at California Baptist University offers a degree completion program that leads to a Bachelor of Arts in English degree in just 16 months. The program consists of 48 units, at least 30 units of which must be taken as upper division courses. The remaining 18 units are comprised of 12 units of lower division courses and 6 units of additional program courses (Overview of the Bible and Foundations of Christian Thought). Students enroll in upper division coursework that include classes in research and writing in literature and language, multicultural literature, literary thought and criticism, and language structure and acquisition. Each online class is eight weeks long. The program has three starting dates throughout the academic year. Chatham University offers a Master of Professional Writing degree that can be completed entirely online. Students admitted to the program can choose from two areas of concentration - technical writing or web content development. Each program is comprised of 30 credits (10 courses) and provides specialized training in different types of professional writing formats (corporate communications, business and financial writing, grant writing, advertising, etc.). The program is flexible and students can complete the requirements for the degree at their own pace. Towards the end of the program, students enroll in a three-credit course that requires them to work on a project for an actual business client. The client project course gives students the opportunity to apply classroom writing principles to real-world professional environments. Clemson University has a Ph.D. in Rhetorics, Communication, and Information Design (RCID) that is offered in a blended format. This is an academic-professional degree that prepares students to perform research and share the findings through university teaching and writing for professional journals. The majority of RCID students expect to work in academia in areas such as English, new media, and writing. The curriculum includes 10 courses, two research projects, and a dissertation. Students must go to the Clemson campus to defend their exams and dissertation. Applicants must have a master's degree in English or a related field, and students can only start the program in the fall. The College of Southern Nevada offers an online Associate of Arts degree with an English emphasis that can be completed online. The program consists of 61 credits, 41 credits of which must come from General Education requirements and include courses in mathematics, U.S. and Nevada constitutions, fine arts, life and physical sciences, and social sciences. The remaining 20 credits are comprised of English courses that cover topics such as English and American literature, literary analysis, and writing about literature. Students must also complete an eight-credit international language requirement as part of the English component of the degree. Language classes must be taken in a single language and consist of advanced-level courses. The AA degree transfers readily to four-year programs in large universities. The Humanities Department at Columbia College offers a Bachelor of Arts in English degree that can be pursued online. At the current time, only the emphasis in literature is available online. In addition to the general education requirements (38-41 semester hours), students must enroll in six semester hours of foreign language classes and complete a three semester-hour multicultural course. A minimum of 39 semester hours must come from the major, which includes courses in literary theory and criticism, history of the English language, major literary periods, and ethnic traditions in American literature. The culminating experience is the completion of a Senior Seminar course that requires students to write and present a critical literary analysis of their chosen topic or genre. Diablo Valley College has an Associate in Arts in English and a similar degree for transfer students. English majors take classes that help them develop skills in reasoning, critical thinking, and communicating, skills that are valuable in a wide range of careers, from law to advertising. Students who graduate from this program are able to transfer to one of the campuses of California State University to complete a bachelor's degree in English. Diablo Valley is the leading community college provider of transfer students to California's four-year schools. While DVC does not officially offer 100 percent online degrees, students can complete many of its degrees online with careful scheduling and by working with an academic adviser. Drury University's College of Continuing Professional Studies has an Associate of Science in English that students can earn entirely online. This is a 62-credit program that includes 26 credits in general education classes and 21 credits in the English major. Students take classes in literature, grammar, and creative writing in several genres. The College of Continuing Professional Studies caters to the needs of busy adult students and uses online classes to provide students with flexibility in scheduling. Students may be able to transfer some previous college credits to Drury to apply toward this degree. The online Master of Arts in English degree available at East Carolina University offers concentrations in technical and professional communication and in multicultural and transnational literatures. The program consists of 33 semester hours, 18 hours of which must be made up of courses from the student's area of concentration. Students accepted to the technical and professional communication program focus on areas such as communication media and technologies, technical editing and publishing, teaching and pedagogy, and civic rhetoric and public discourse in various contexts such as healthcare, science, government, etc. The multicultural and transnational literatures program has two threads of study - ethnic literatures of the United States (multicultural literature) and world literatures from global, diasporic, colonial and post-colonial standpoints (transnational literatures). Emerson University offers some specialized writing programs in an online format. The Master of Fine Arts in Popular Fiction Writing and Publishing is for students who write in genres such as young adult, fantasy, or science fiction. Students attend online workshops and take literature courses but never have to come to campus. The Graphic Novel Writing and Illustration Certificate is another entirely online program, requiring students to complete three courses. The low-residency Master of Fine Arts in Writing for Film and Television requires students to spend six days on campus each semester of the two-year program. Emerson ranked 7th in the listing of Best Regional Universities in the North in the 2018 U.S. News survey of best colleges. Harvard University offers a Master of Liberal Arts - English degree that can be completed partially online. Students are required to enroll in at least three on-campus classes: the proseminar (Graduate Research Methods and Scholarly Writing in the Humanities), an English seminar course, and a regular or elective course. The remaining six courses can be taken online. Students must also complete three pre-admission courses (including the proseminar) before they can be considered for admission to the program. Harvard has fall, spring, and summer admission cycles. A thesis is required for the degree. Students work with a thesis director and choose a research topic that corresponds to their professional experience and academic goals. The online program does not currently offer a non-thesis option. Indiana University East offers a Bachelor of Arts online completion program in English with an emphasis in technical and professional writing. Students can transfer up to 64 credit hours of general education and pre-requisite courses from community colleges or other two-year institutions. The BA completion program consists of 60 credit hours (20 classes) and can be completed with two years of continuous enrollment. A minimum of 15 credit hours in a student's field of concentration must be taken at the university. Students work with an academic advisor to devise an individual plan of study based on their educational background. The curriculum includes a varied coursework, including classes in technical editing, studies in American culture, grammar and usage, and studies in British/Commonwealth culture. JHU's Master of Arts in Communication mixes digital media with old-fashioned writing skills. It's a 10-course program with three start dates, and the admissions committee looks for good writers with either academic coursework or work experience in the area. Admitted applicants must opt for the Strategic Planning or Research Tracks. The former requires four classes that meld research and practice, plus six electives; the latter is nearly the same. A notable difference is that it replaces one elective with a thesis. The program also builds in six optional concentrations. Students can choose up to two, including Political Communication, Digital Communication, and Corporate and Non-Profit Communication. Lindenwood University offers a Master of Fine Arts in Writing degree that can be pursued 100 percent online. The program consists of 48 credits. Many online students enroll in two classes each quarter, enabling them to earn the degree in just two years. Students have five years from the time of their initial enrollment to graduate from the program. The curriculum includes coursework in a variety of genres: fiction, poetry, narrative journalism, creative nonfiction, scriptwriting, and literary journal editing. Classes are available asynchronously. The program has a rolling admission policy, offering four deadlines each year. MFA graduates are fully qualified to teach college-level writing classes such as freshman composition, beginning and advanced creative writing classes, and English and literature courses. Mercy College offers Bachelor of Arts (BA) and Master of Arts (MA) degrees in English that can be pursued online. The BA program requires students to enroll in courses in the following categories: classical texts, social and cultural contexts, literary genres, historical periods, and language and writing. The MA in English Literature degree consists of 30 credits. Students can follow a full-time (six credits or two courses per semester) or part-time (three credits or one course per semester) plan of study. The program must be completed within six years of a student's initial enrollment. Students are also required to pass a three-hour comprehensive exam and write a final thesis on an original research topic in order to graduate from the program. Minnesota State University, Mankato, has a Master of Arts in Literature and English Studies that students can complete online. Graduates with this degree are prepared to teach at a technical or community college, pursue a doctorate in English, or work in the literary world. The curriculum calls for 34 credits, including an alternate plan paper capstone. Students are encouraged to pursue an internship that reflects their career goals, and they can receive credit for the internship. Applicants should have a bachelor's degree with at least 30 credits in related coursework, and they must submit two recommendations and an analytical writing sample. GRE scores are not required. Students may enter the program in the fall, spring, or summer semester. The Master of Arts in English at Morehead State University is a 33 credit program that can be completed entirely online. Students can choose a thesis or non-thesis option. Non-thesis students are required to take an additional six credits of coursework, which can be from any department in the university. A minimum of 27 graduate credits must be comprised of English courses in writing, linguistics, a major author, literature (at least three hours each of British and American literature classes), and electives. All students are required to take the MA in English Exit Examination in order to graduate from the program. The exam is given two times every year (April and November) and students may not take the exam more than twice. National University offers online Bachelor of Arts (BA) and Master of Arts (MA) degrees in English that can be completed online. The BA program offers a concentration in creative writing. Academically qualified students who plan to pursue graduate studies may register for the BA English/MA English transition program that allows them to earn the MA degree in less time. The MA in English degree is comprised of a minimum of 45 quarter units. The core requirements for the MA degree includes seminars in theory, research, and literature courses, which focus on a literary period, a major author, and a literary theme. Students can further personalize their program by taking electives in areas such as film studies, creative writing, and rhetoric. The online Master of Arts in Professional Writing degree offered at New England College is an accelerated 12-month program comprised of 36 graduate-level credits. The curriculum focuses on both emerging and traditional writing-based media. Students accepted to the program are required to take the following courses: Editing and Publishing, Writing for Media and Public Relations, The New Media, Business and Technical Communication, and Special Topics in Professional Writing. Students must also enroll in a capstone portfolio course for one credit each term. At the end of the program, students will have a professional digital-based portfolio of their work through the capstone course. The portfolio will reflect their writing strengths and interests, as well as their knowledge of various research methodologies. The Department of Languages and Literature at Nicholls State University offers a Bachelor of Arts degree in English that can be pursued online. The program follows an accelerated format, offering courses that are eight weeks in duration. Most students typically complete the program in just three years. Although the department offers four areas of concentration (creative writing, literary studies, film studies, writing and rhetoric), only the literary studies concentration is currently available online. Students enroll in classes that cover British, American, and world literature, as well as take courses on a variety of genres that include poetry, drama, the novel, and film. The program also offers coursework in linguistics, grammar, creative writing, and on specific authors and literary periods. Northern Arizona University offers online Master of Arts in English programs in the following fields of emphasis: literature, professional writing, and rhetoric writing and digital media studies. Each program consists of a minimum of 30 graduate-level credits. Students accepted to the rhetoric writing and digital media studies program can customize their learning experience by selecting courses from various disciplines (ESL, linguistics, literature, etc.) that support their academic and professional goals. Working with a faculty advisor, students can opt to write a thesis or complete a research project to graduate from the program. An 18-credit online Graduate Certificate in Professional Writing is also available. The certificate can be earned as part of the MS in Professional Writing degree or as a stand-alone program. The online Master of Arts in English program available at Northwestern State University of Louisiana is a 30-credit program with concentrations in: writing and linguistics, literature, folk life or southern culture, generalist, and TESOL (Teaching English to Speakers of Other Languages). Each concentration area is comprised of 24 credits. The remaining 6 credits will come from the degree completion option selected by the student - a thesis or two papers-in-lieu of a thesis. Students who choose the latter option will be required to enroll in an additional elective course. Students can also enroll in a three-credit internship course, which must be comprised of at least 160 hours (over the course of one semester). Only one internship course can be applied towards the degree. The Department of English at Old Dominion Univesity has three graduate-level programs for online students. The Master of Arts in English professional writing concentration is entirely online with a mix of synchronous and asynchronous course elements. This 30-credit program gives student the option of completing a portfolio, thesis, or comprehensive exam only. There is also a Graduate Certificate in Professional Writing, which requires four classes with a mix of synchronous and asynchronous elements. The Ph.D. in English requires students to select two emphasis areas from four choices, including a self-designed emphasis. This 48-credit program requires distance learners to attend two on-campus Summer Doctoral Institutes. Many online classes for this degree have a live component. South Texas College offers an online Associate of Arts in English degree that is comprised of 61-62 credit hours. Students who earn the degree can transfer the credits as a block to programs in four-year institutions that lead to a Bachelor of Arts in English or a Bachelor of Arts in General Studies. The program allows for the completion of at least 15 credits (5 courses) of English electives, in addition to classes in U.S. government, history, social science, drama, speech communication, mathematics, and life and physical sciences. Students can take their English electives in the field (literature or creative writing) that corresponds to their educational and professional goals. Some English courses may also count towards the 24-credit hours required for teaching. Southern New Hampshire University offers a Bachelor of Arts in English Language and Literature degree that can be completed online. Because courses are available asynchronously, students can access their classes at any time and from anywhere. There are more than six 9-week terms each year, giving students ample flexibility to complete their undergraduate degree at their own pace. There are two Master of Arts (MA) degrees available online - MA in English and Creative Writing and MA in English. Students accepted to the English and creative writing program can choose from the following areas of concentration: fiction, non-fiction, poetry, and screenwriting. Each MA program can be completed in as few as 15 months, with students enrolling in two courses every 10-week term. SUNY Empire State College is the rare school that does not offer an English degree, online or on campus. Instead, students can pursue an associate or bachelor's level Cultural Studies degree and create a concentration that focuses on writing, literature, communications or something of their own design. The college takes care to put individual courses into its distance education lineup. That includes about 20 undergraduate classes in Communications and Media - from Communication Theories to Digital Storytelling - and nearly as many in Literature - covering topics such as Shakespeare, children's books and mythology. Writers also have online outlets, with courses in creative, technical, academic and proposal writing. Texas Tech University offers a Master of Arts in English degree that is comprised of 36 semester hours and can be pursued online. Students accepted to the program can choose from the following areas of specialization: British and American literature, creative writing, comparative literature, and linguistics. All specializations are available online except for the creative writing option. Sub-specialization areas are currently offered in film and media studies; book history; literature, social justice and environment; nineteenth-century studies; and comparative literature, globalization, and translation. Students can follow a full-time or part-time program of study and pursue a thesis or non-thesis option. Non-thesis students can supplement their learning experience by enrolling in a minor or taking courses in linguistics, technical communication, or rhetoric. The University of Texas El Paso offers a fully online Graduate Certificate in Technical and Professional Writing. The program is comprised of 12 graduate-level credits (four courses) and can be completed in two semesters. The program provides training and instruction for different types of writing required in various industries and professional settings (print, digital communication, social media, etc.). Additionally, students are given the opportunity to study new media and advanced communication technologies that give them the skills to develop content for a diverse audience. Students are required to enroll in a professional writing seminar on editing that cover topics such as copyediting, web editing techniques, copy marking, and comprehensive editing. Courses are taught by a multicultural and multilingual faculty. The University of Texas Tyler offers a Master of Arts in English degree that can be pursued online. The program consists of 36 semester hours of graduate-level coursework and has a thesis and non-thesis option. The non-thesis option will require the completion of additional coursework. The program has a foreign language component. Students must complete 12 hours of instruction in a single foreign language or demonstrate an equivalent competency. A student's native language may not be used to fulfill this requirement. The curriculum includes courses in literary theory and criticism, history and practice of rhetoric, bibliography and methods of research, and studies in creative writing. Graduate coursework follow a course rotation schedule, therefore, some courses may not be offered every year. Troy University offers an online major in English. Undergrads who major in English are required to complete at least 36 credits in English classes, including a class in advanced grammar and 30 credits in upper division courses. Most classes are delivered in nine-week terms, so students can concentrate on fewer courses at one time while still making progress toward their degree. Troy University's online programs attract a large number of military personnel, and the university provides special programs including the virtual Troy for Troops Center where veterans and active-duty personnel can go for academic and career support, Veterans Affairs Counseling, or just to talk to someone who understands their life experiences. Tyler Junior College offers an Associate of Arts degree in English that can be completed 100 percent online. Students admitted to the program must enroll in a minimum of 60 credits, 42 credits of which must be taken from the core curriculum requirements (mathematics, creative arts, communications, life and physical sciences, language, philosophy, and culture, etc.). English coursework includes classes in composition, technical and business writing, British and American literature, creative writing, and world literature. Students are encouraged to include a foreign language component to their plan of study. Courses must be taken in sequence in a single foreign language. Online courses that are satisfactorily completed at Tyler Junior College transfer readily to all public universities and colleges in Texas. The Bachelor of Arts (BA) in English degree that is available online at the University of Central Florida offers three areas of concentration: creative writing, literature, and technical writing. Students must satisfy a foreign language requirement with a proficiency equivalent to three semesters of college-level instruction. Some courses for the BA degree may be available only on-campus. The technical writing concentration includes coursework in documentation and client-based collaboration, technical publication and project management, writing for the technical profession, and visuals in technical documentation. The university also offers a Master of Arts (MA) in Technical Communication degree that can be pursued entirely online. The MA degree consists of a total of 33 credit hours and offers a thesis and non-thesis option. Students admitted to the Bachelor of Arts in English Writing program offered at the University of Colorado Denver are given the option of pursuing the degree entirely online. The program consists of 120 credits, no less than 39 credits of which must come from English coursework. The curriculum includes courses in multimedia composition, language theory, advanced rhetorical analysis, introduction to film, and creative, business, and technical writing. Online classes are kept small (with a 17:1 student to teacher ratio) to facilitate interaction and exchange among students and between students and instructors in the virtual classroom. Just like on-campus students, online students have access to the Experiential Learning Team, which assists students in finding internship opportunities and other professional work experiences. The University of Houston Downtown offers an online upper level coursework program that leads to a Bachelor of Science in Professional Writing degree. Applicants must already have an associate's degree or completed core coursework from a community college or another university to be considered for admission. The curriculum includes classes in technical writing, web content writing and editing, social media management, web design, proposal writing, and public relations management. Students must complete an internship experience in order to graduate from the program. Students must also make sure their internship opportunity has the approval of their faculty mentor prior to beginning the program. Up to six credits can be earned and applied towards the BS degree with the completion of an internship. The online English program at the University of Illinois in Springfield is a degree completion program leading to the Bachelor of Arts in English degree. Applicants must have fulfilled all General Education requirements or hold an associate degree in order to be considered for admission. The program is comprised of 34 credit hours, which consists of courses in literature (American, British, world, women's, etc. ), specialty topics (such as linguistics), and literary research and theory. At the current time, only the concentration in literary studies is available online. The program follows the traditional semester schedule and employs a variety of learning methods such as independent studies, tutorials, and multidisciplinary coursework. It is possible for students to earn credit for prior learning. The University of Maryland University College offers a Bachelor of Arts in English degree that can be pursued online. In addition to completing the General Education requirements (41 semester credits), students must enroll in 30 semester credits of coursework in the major. The curriculum contains courses that cover defining literary eras and genres that provide students with a firm foundation in the discipline. Core requirements for the degree include coursework in Renaissance literature, 17th-century to 19th-century British literature, early and modern American literature, critical approaches to literature, and the history of the English language. Students must enroll in a capstone course towards the end of their senior year and complete a research thesis or project in order to graduate from the program. The University of Massachusetts Lowell offers a Bachelor of Arts in English degree that can be pursued completely online. Although grounded in classic American and British literary traditions, the curriculum nevertheless includes courses in modern topics such as English studies in a digital environment and technical and scientific communication. Students can fulfill the foreign language component by selecting the 12-credit World Languages Track, which consists of four consecutive courses taken in the same language. The 15-credit World Ready Track consists of two courses in the chosen language and three classes (conducted in English) from other departments that focus on the culture, political context, literature, etc. of the region where the chosen language is spoken. Students must complete a capstone course to graduate. The Bachelor of Arts in English degree at the University of Memphis offers the following areas of concentration: African American literature, creative writing, ESL (English as a Second Language), language and linguistics, literature, and professional writing. The concentrations in African American literature and professional writing can be completed entirely online. The other areas of concentration have on-campus components. The university also offers a Master of Arts (MA) in English degree that can be completed online as well. The program has a concentration in teaching English as a Second Language (ESL). The MA program is comprised of 33 graduate-level credits. Students can earn a 15-credit Certificate in Teaching English as a Second/Foreign Language in the course of pursuing the MA degree. The online Master of Arts (MA) in English degree offered at the University of New Orleans has concentrations in literary studies and in rhetoric and professional writing. The MA program is made up of 36 credit hours, 15 of which consists of core courses which all students must take - an introduction to graduate studies in English and a course each in rhetoric, professional writing, British, and American literature. Nine credits taken in a student's area of concentration and 12 credits of electives complete the required 36 credits for the degree. Thesis and non-thesis options are available. Students who choose the thesis option must complete one comprehensive exam in addition to a thesis. Non-thesis students are required to complete two comprehensive exams. Utah State University Online offers a Master of Technical Communication (MTC). Designed for working professionals, aspiring academics, and high school English teachers, the MTC is 33 credits long. The only required courses are an introduction to the topic, an editing course, and a rhetorical theory class. Electives introduce topics such as research methods, approaches to teaching, managing publications and designing documents. Although the program is totally online, only a handful of courses are offered each term, meaning that students typically take three years to graduate. However, they might be able to expedite the process by attending courses at Utah State's Logan campus. Washington State University offers an online Bachelor of Arts in Humanities degree with several concentration areas, including English. Students can choose from two plans of study: Plan A, which allows them to select two areas of concentration, or Plan B, which allows them to choose three areas of concentration. English is offered as a primary concentration area in both plans. Plan A students complete 24 semester credits in their chosen primary concentration and 15 semester credits in a secondary concentration. The Plan B option requires students to complete nine semester credits in each area of concentration. All students must complete a foreign language requirement (one year of college-level instruction or two years of high school classes in a single foreign language). Wilkes University offers Master of Arts (MA) and Master of Fine Arts (MFA) degrees in creative writing that can be pursued online. Students can choose from two delivery formats. The low-residency format features online classes with two eight-day, on-campus residencies in January and June. The weekender format combines online courses with four weekend sessions each semester in either the Wilkes-Barre campus in Pennsylvania or in Mesa, Arizona. The MA program is comprised of a minimum of 30 credit hours. Students can choose from the following areas of study: fiction, poetry, playwriting, screenwriting, publishing, creative nonfiction, and documentary films. To earn the MFA degree, students must enroll in 18 additional hours of study to fulfill the 48-credit hour minimum required for the degree.